The use of data and Artificial Intelligence in business contexts has given rise to an all-new set of ethical questions and concerns that need to be addressed. 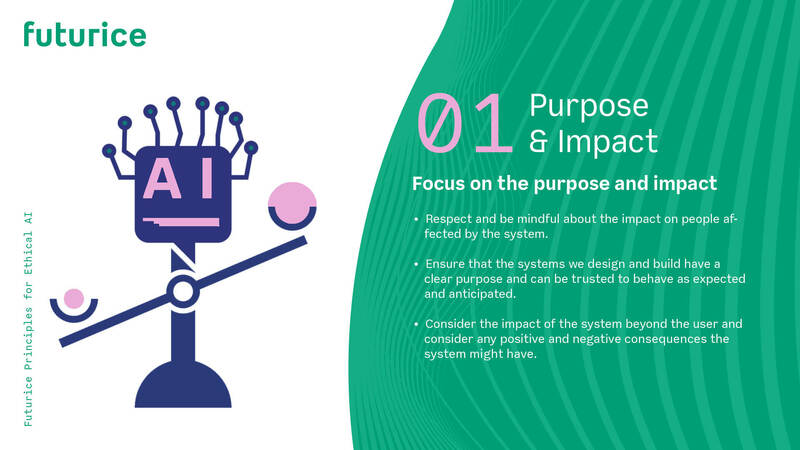 Our own approach was to create a set of principles that guide our decision-making whenever we work with AI. 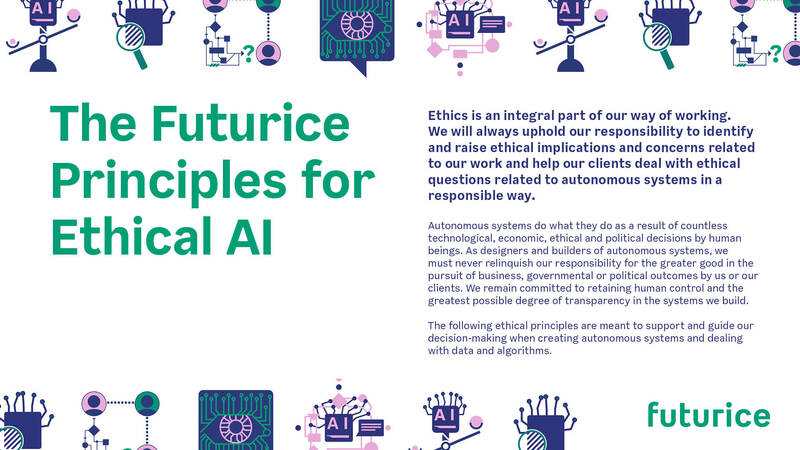 As an integral part of our Futurice Data & Ethics initiative – and also coinciding with our role as a key contributor in AI Finland’s Ethics Challenge – we recently set out to come up with our own Principles for Ethical AI for our work. As a result, we now have a set of tailored principles that we are also happy to share with our clients and the rest of the community. 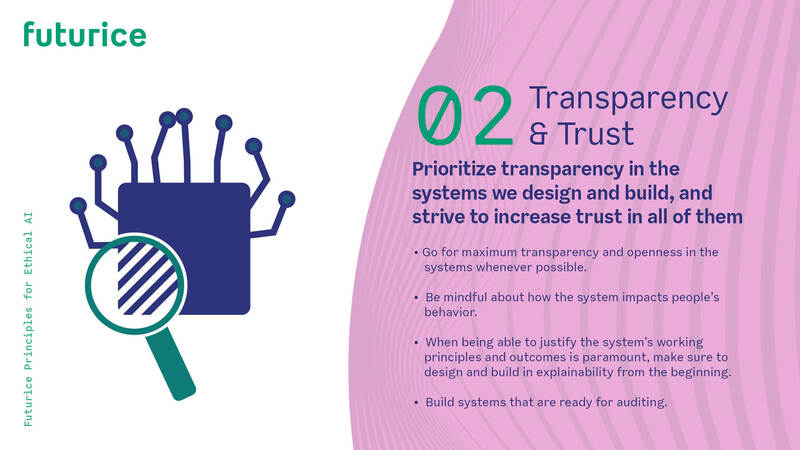 These principles are meant to support and guide our decision-making whenever we are creating autonomous systems and dealing with data and algorithms. 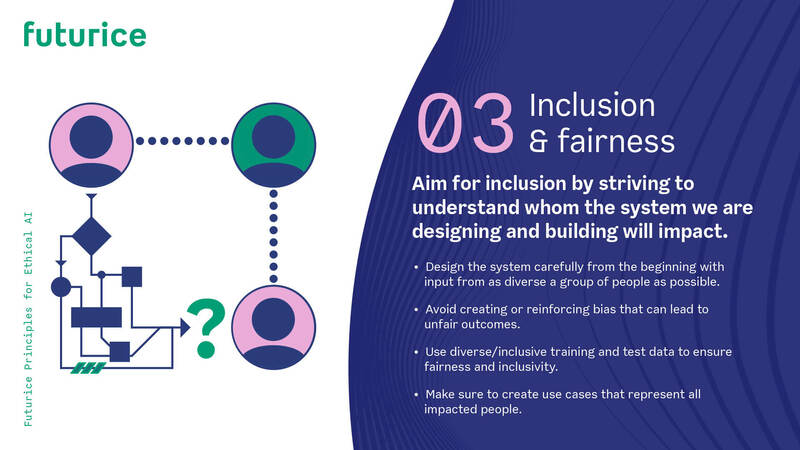 As our work deals with ethical issues on a very practical level, we wanted our principles to also reflect this at a slightly more concrete level than just high-level statements. 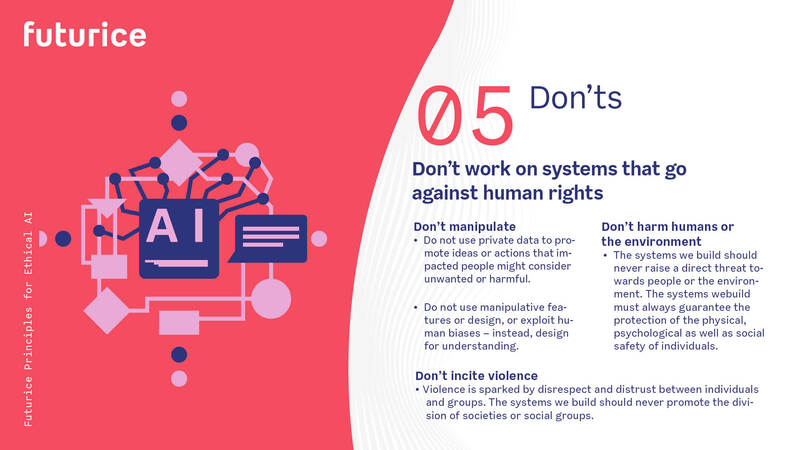 These principles are not set in stone – they will be frequently adjusted as the field of data & AI ethics advances, and also based on feedback from our teams, clients and other stakeholders. Due to a high demand for concrete tools to help address ethics questions in project environments, we have also created a Data Ethics Canvas, designed to be used to help identify ethical aspects and concerns when starting a project, and trigger a discussion between team members. The Data Ethics Canvas is available here. It is licensed under the Creative Commons CC BY-SA 4.0 license, so feel free to utilize it in your own organization and provide feedback on improvements as well. You can find a series of illustrations of our Principles for Ethical AI below, and access them in PDF format here, as well as in plaintext format on GitHub. We hope they will inspire you to reflect on the same questions in the context of your own organization, and encourage you to create a similar set of principles for future use.